China's Yunnan Province is the most geographically, biologically, and ethnically diverse region in China. Stretching from the Himalayan plateau to the subtropics, the province is home to thousands of species of plants and animals as well as twenty-four of China's minority groups. As a result, Yunnan is one of the most culinary interesting and delicious places on earth, with a wide variety of cuisines and flavors all packed into one small province. COOKING SOUTH OF THE CLOUDS: Recipes and Stories from China's Yunnan Province by food and travel writer Georgia Freedman offers a tour of Yunnan's many foods, from the famed Crossing the Bridge Noodles to dishes like spiced chicken grilled in banana leaves, which will introduce cooks to a side of Chinese cooking still relatively unknown outside of the country itself. Each chapter in the book covers a different area featuring its classic recipes such as Tibetan momo dumplings from the north, grilled chicken with chiles and fresh herbs and the famed "crossing-the-bridge" noodles from the south, fried rice with ham, potatoes, and peas from the east, and roasted eggplant salad with tomatoes and herbs from the west, near the Burmese border. 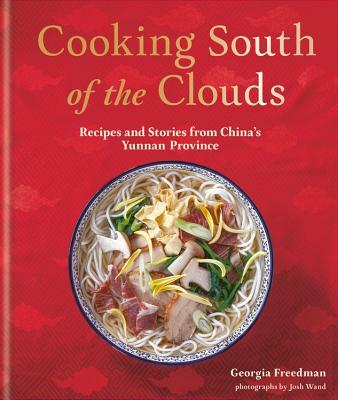 Complete with profiles of local cooks, artisans, and farmers, as well as breath-taking location photography, COOKING SOUTH OF THE CLOUDS takes you on an unforgettable journey through the land of Shangri-La and presents a whole new world of flavors. Georgia Freedman is a freelance journalist and editor based in the Bay Area. Her writing has appeared in the Wall Street Journal, Afar, Martha Stewart Living, Rodale's Organic Life, Roads and Kingdoms, and other food and travel publications including Saveur magazine, where she was previously the managing editor. Georgia has been traveling to China to learn about the country's food and culture since 2000, and she lived in Yunnan Province for two years. She returns to Yunnan regularly with her husband, Josh Wand, and their young daughter, and she shares stories about their travels at ChinaSouthoftheClouds.com.